78ers at Sydney Mardi Gras 2018 - Photos by Jeffrey Feng Photography. Four decades on from a night of political protest that eventually became a celebration, the Sydney Mardi Gras spirit continued on Saturday night with an estimated 300,000 spectators filling the streets to watch over 12,000 participants take part in one of the world’s biggest celebration of the LGBTQI community. The 2018 Parade, themed ‘40 YEARS OF EVOLUTION’, involved thousands of LGBTQI people and their champions from all across the globe uniting in creative self-expression and a celebration of diversity and equality. The parade was huge and it felt like it for both participants and spectators who watched for more than four hours, many had also been at the site hours before the official start. Sydney Mardi Gras 2018 – Photos by Jeffrey Feng Photography. Spectators were joined by the Prime Minister Malcolm Turnbull and his wife Lucy, the Opposition Leader Bill Shorten and his wife Chloe and a host of other politicians, media and sporting personalities keen to show their support for the 40th anniversary and celebrate last year’s marriage equality decision. But it was international pop superstar Cher who brought the parade to a standstill. Sporting bright orange hair and walking with dancers holding large purple letters of her name, the gay icon arrived to the tune of Turn Back Time. Cher with QANTAS parade participants at Sydney Mardi Gras 2018 – Photos by Jeffrey Feng Photography. The singer, who was the headline act for the after-party, had been rumoured to make an appearance in the parade and about 8pm, the crowd began chanting her name as she stepped out into Taylor Square. Speaking to reporters before the parade began Mr Turnbull described the parade as a “wonderful part of Sydney”. “It’s 40 years old and 40 years ago Lucy and I had our first date so our love affair is a result of Mardi Gras,” Mr Turnbull said. 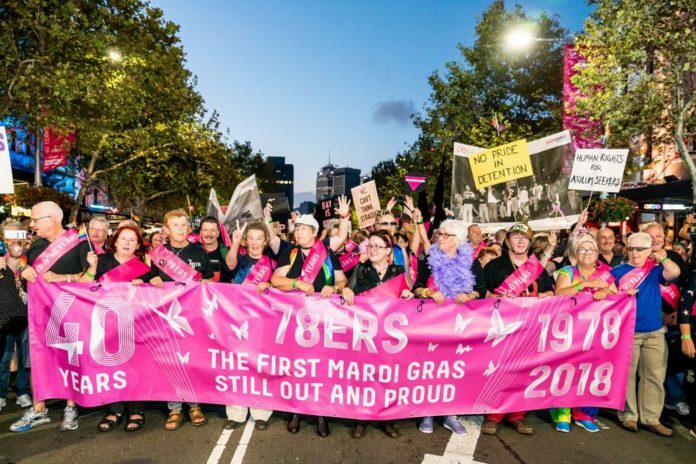 Sydney Gay and Lesbian Mardi Gras CEO Terese Casu said the participation of every single person in this year’s special anniversary Parade helped produce a dazzling display of self-expression, reflection and celebration. “Beyond the glitter, flamboyance and satire, there were so many floats reminding us of the serious issues. 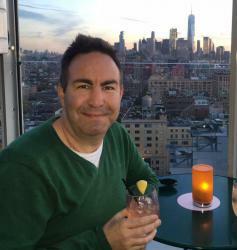 Acceptance, inclusivity, diversity, respect,” Casu said. “Among this year’s many floats were many paying tribute to the original Mardi Gras marchers, our 78ers, and our 40 year anniversary. Indeed over 200 78ers from all over Australia made their way to Sydney to lead the Parade train with the First Nations float. Mr Gay Pride Australia 2017 David Francis at Sydney Mardi Gras 2018 – Photos by Jeffrey Feng Photography. New Zealand was also represented by our very own Mr Gay New Zealand 2018 Ricky Devine-White who rode in the back of a Holden Equinox along with Mr Gay Pride Australia 2017 David Francis.